Anyone who has seen the flag of Mexico is probably familiar with the Mexican coat of arms. It’s the picture of an eagle holding a snake. However, the Mexican coat of arms is more than just decoration for their flag. The Mexican coat of arms is a long-standing symbol of the country’s culture, legends, and politics. The Mexican coat of arms owes its origins to an Aztec legend. According to the legend, the leader of a nomadic tribe was visited by a god named Huitzilopochtli in a dream. The leader was told by the god that the tribe would come across an eagle, perched on a cactus, devouring a snake. They were ordered to settle wherever they found this eagle. The tribe did so in 1325, despite the swampy conditions of the area. This land would become Tenochtitlan, which is now called Mexico City and is one of the largest cities in the world. It would be centuries before the iconic image of the eagle holding a snake on top of a cactus became the Mexican coat of arms. In 1811, during Mexican’s war for independence from Spain, a Mexican eagle became a popular seal for official documents. Revolutionary leader José María Morelos y Pavón would later add the eagle to his flag. Once independence was finally won, the eagle was redesigned to reflect the famous legend. While the details of the Mexican coat of arms have evolved several times since the 1820s, the basics have not. The current Mexican coat of arms was designed in 1968 and remains a symbol of patriotism to this day. 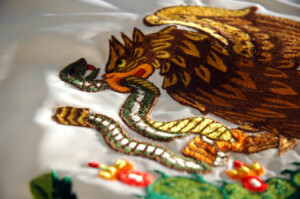 Because in addition to honoring the old legend, the Mexican coat of arms also represents triumph: the eagle, often believed to be a noble creature, defeating a treacherous snake. Next time you spot the flag of Mexico, take a moment to look at the Mexican coat of arms. Here at Acapulcos Mexican Family Restaurant and Cantina, we take great pride in what the flag of Mexico and the Mexican coat of arms represent. We value authenticity of Mexican culture and cuisine. If you’re ever in the mood to experience an authentic Mexican restaurant, feel free to drop by in one of our twelve Massachusetts or Connecticut locations. We would love to have you! Did you know that there was so much history behind the Mexican coat of arms? What aspect of the Mexican coat of arms did you find most interesting?